The Village of Lakeview Water system is committed to providing residents with the safest and most reliable drinking water. Safeguarding the drinking water is a responsibility that everyone shares. As part of that responsibility, we have a cross connection control program to help protect the drinking water supply from contamination due to cross connections. A cross connection is a connection or arraignment of piping through which water of a questionable quality, wastes, or other contaminates could enter the drinking or portable water supply due to a reversal of flow. There are several ways cross connections can happen. For example, a drinking water line may enter an industrial facility and be piped, or connected to, a chemical rinse tank. If the water flow were to reverse (due to a water line break outside, a fire in a neighboring structure or something similar), the chemicals could be sucked into the drinking water system. This type of event is called backsiphonage. If the chemical rinse tank was pressurized at a greater pressure than the drinking water system, the chemicals could be forced into the drinking water system. This type of event is known as backpressure. Another example of a cross connection could be when filling a swimming pool with a garden hose. If the garden hose was submerged and a water line break occurred down the street, this could cause a loss in pressure and the contents of the pool could be “vacuumed” back into the water supply. This is another example of backsiphonage. Cross connections are prevented through one of two ways: physical separation or use of a backflow preventer. Physical separating means there is a gap of air between the source of contamination and the water supply. 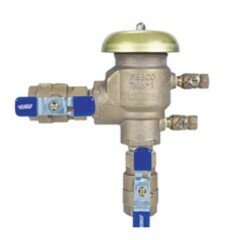 Backflow preventers are used to ensure that cross connections do not occur in situations like the chemical rinse tank example. This mechanical device, if installed correctly and maintained, is designed to prevent contaminated water from entering the drinking water supply. There are many different types of backflow devices that can have different applications depending on the situation. WHAT ARE OTHER EXAMPLES OF CROSS CONNECTIONS? HOW ARE CROSS CONNECTIONS REGULATED? The Michigan Department of Environmental Quality (MDEQ) requires water utilities to have a cross connections control program. This is defined in Part 14 of the Michigan Safe Drinking Water Act. Additionally, the MDEQ has published a Cross Connection Rules Manual which more fully explains Cross Connection Control Programs. The Michigan Plumbing Code also has requirements regarding prevention of cross connections. The Village of Lakeview water and sewer utility bills are billed monthly and are due on the 20th of each month. Payment can be completed in person at the Village Offices at 315 N. Lincoln Avenue in downtown Lakeview, dropped off in one of the Village's secure drop boxes located at the Washington Street entrance of the Post Office or in front of Village hall, or can be mailed to P.O. Box 30, Lakeview, Michigan 48850. Online payments may be made at this link. If you make an online payment and receive a shut off notice, please contact the village office. Please Note: Effective March 1, 2017, the charge for water turn on/off fees for the Village of Lakeview will be increased to $50.00. If you are unable to make it in to pay your account before the shut off date, please fill out the form below and email it to clerk@villageoflakeview.org or simply drop it in one of our utility boxes available at the Post Office or in front of the Village Office building before the shut off date to avoid water interruption. For more information or questions regarding a utility bill, or to request an account change, please call our offices at (989) 352-6322.